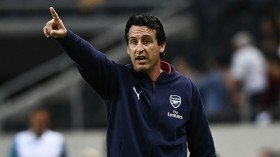 Emery to be handed £40m transfer kitty for the summer? Arsenal boss Unai Emery could reportedly have a tough summer transfer window with the club allotting just £40m to spend on new recruits. The Gunners landed just the single signing of Denis Suarez on loan from Barcelona in January and it is understood that they can sign him on a permanent basis for £18m in the summer. Still, Emery may have to do with a restricted budget for the next transfer window with The Mirror claiming that the board will only hand £40m to facilitate the combined business. It is added that the Spaniard could, however, recoup additional funds from player sales and that may be the case with Mesut Ozil and Shkodran Mustafi among those who could head through the exit door. Arsenal are currently sixth in the Premier League standings, three points off fourth-placed Chelsea with just 13 games remaining before the close of the campaign. The north London side are scheduled to face Huddersfield Town on the road this weekend and Emery will expect nothing less than three points against the league's bottom side.